As a result of the military defeat in World War II, followed by the disillusionment created by the emperor's statement, a fifty year period has passed in which there has been a moral vacuum. For most of this time, the Japanese have busied themselves with materialism. They replaced the gods of their ancestors and the god of the emperor with the god of money. This god seemed to please them and to bless them for forty years of growing prosperity, in what was widely known as the "Japanese miracle." However, in 1990, when Japan's economic bubble burst, the Japanese were once again disillusioned, realizing that the god that they had served was indeed no god at all. This has created a climate in which the spiritual and emotional needs of the people of the nation have become more apparent than ever before. Japan is indeed a nation in search of its soul. The spiritual needs are felt on a nation-wide basis. They are also felt within the church itself. There are many new schools of Buddhism, which often manifest themselves in rather strange cults. The most bizarre of which was the Aum Shin Rikyo cult, which created such chaos and fear throughout Japan in the spring of 1995, when they unleashed poison gas on a crowded subway train. Interestingly, that incident simultaneously created disdain for organized religion, which had negative repercussions for Christian churches. At the same time, it created an awareness of and a fascination in cults on the part of many Japanese young people. It was astonishing to many leaders in the society that young people, who had been raised in good homes and had been educated at outstanding universities would abandon their careers to join cults that demanded extreme loyalty to the leader at the expense of all other relationships with family and company. One of the greatest challenges that Christians face is that of seeking to proclaim Jesus Christ as the one true and living God. Many Japanese would be happy to embrace Him as another great teacher. However, they consider our claims concerning Christ to be arrogant and offensive. Similarly, pressures on Christians to conform within Japan's homogeneous culture are sometimes overwhelming. As the proverb goes: "The nail that sticks up gets whacked down." Nationally, Christians number only 1/2 of 1% of the population. For example, only 2.1 people of every 1,000 attend Christian worship services. And this pressure to conform causes many baptized Christians to fall away within the first 5 years. Japanese Christians need encouragement in their faith; family and societal pressures inhibit their consistent involvement in church. 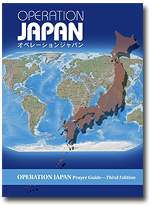 See how Asian Access' Summer Teams help Japanese to overcome their fear of visiting a church. Within the church, one of the biggest challenges that we face is that of pastors who reflect the aging trends in society at large. Currently, the average age of a pastor in Japan is approaching 60 years of age. Seventy-five percent (75%) of the pastors are over 55. There are more pastors active in the church in Japan who are past 80, than there are those under 30. Asian Access' Church Multiplication Teams are helping to change this, as we encourage senior pastors to deploy young pastors to multiply new congregations. Japan is suffering from a spiritual void. One young man on Asian Access' video says, "I don't know what is Truth, so please tell me!" From political scandals to bank failures, from the inability to deal with earthquakes to school violence – the Japanese are searching for answers. Teens especially seek satisfaction in material goods (e.g., stylish clothes, cell phones), that cannot fill this spiritual vacuum. They need someone to point the Way. The greatest need in Japan, as is true in many parts of the world, is for expressions of authentic friendship and genuine witness among those in the church. Despite the needs in the church and the culture at large, the greatest need is for people who faithfully live and represent the reality of Christ and the power of the Gospel. The Japanese need the Life and hope that Christians can bring. See how two Asian Access summer missionaries befriended a young Buddhist woman who would later influence 19,000 Christians at Urbana.